Architects and urban designers have debated streetscapes for many decades. As early as 1889, the Austrian architect Camillo Sitte wrote of the importance of continuous, connected building facades that lined streets and defined their form. Beautiful public spaces have a sense of enclosure, said Sitte; they feel like outdoor rooms. A few years later the German architect and planner Josef Stübben covered the height-to-width proportion of streets in his handbook of city planning. In the 1920s and 30s the architect Le Corbusier issued several emphatic rejections of such ideas. “DEATH TO THE STREET,” he thundered, decrying the traditional streetscape as dangerous, unhealthy, chaotic, and congested. The ideas promulgated by Corbusier and other modernist planners were in tune with the needs of the motor industry: dispersed towers, wide buffers, and large highways. The design of new highways and arterials in cities came to resemble the auto-oriented visions of modernist planners. The chorus of voices defending traditional streetscapes snowballed during the 1960s-1990s. Hundreds of new streetscapes were built based on traditional patterns. 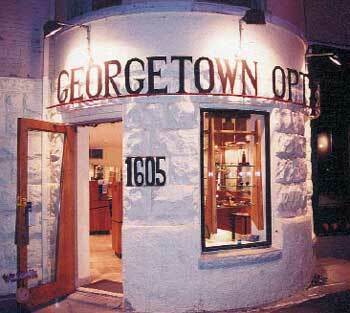 Infill development re-established traditional streetscapes in existing city districts. Today one can find both patterns actively promoted in all cities of the world. The debate continues as vigorously, and sometimes as contentiously, as ever. One condition keeping the debate alive is the various arguments, theories, and polemics lack solid empirical support. Many designers and engineers have a gut feeling about the best way to design streetscapes but statistical evidence is thin. Several streetscape surveys have been developed, and researchers have used them to carry out a few studies. The surveys require teams that manually evaluate each street segment using checklists of tens or hundreds of factors. The process is laborious, slow, and expensive; and as a result, the studies to date have been limited and somewhat inconsistent. That’s why a thesis by Chester W. Harvey titled “Measuring Streetscape Design for Livability Using Spatial Data and Methods” (2014) is an important advance in the urban design field. Harvey developed a computerized method to evaluate the essential form of streetscapes. He tested the results against a survey of streetscape appeal and found significant relationships. The theories and speculations of the past 125 years have finally been confirmed with a large sample set: streetscapes shaped like outdoor rooms are perceived to be safer and more attractive to walk in. And that is only the beginning, as the method offers many other potential avenues of investigation. This wonderful drawing is from the Downtown Precise Plan of Redwood City, California. It show 21 signage types that are commonly encountered in pedestrian-oriented, mixed-use frontages, streets and districts. The drawings are by Dan Zack, project manager of the city’s community development department. The layout is by Freedman Tung & Bottomley, lead urban design consultant for the Precise Plan. In the extended entry, a key to this drawing with short definitions of each sign type from the Downtown Precise Plan. As we had recently upgraded our own kitchen surfaces with granite, at a cost of several thousand dollars, we wondered how the use of such an expensive material can be justified by the city. Turns out the granite saves labor and money in the long run. Ordinary concrete lasts 10-20 years depending on usage and conditions, while granite lasts many decades or even centuries. Yes, it’s more expensive than concrete — about $45 per linear foot vs. $25 — but it’s more durable, said Abdullahi Mohamed, a supervisory civil engineer with the D.C. Department of Transportation. Granite — solid, heavy — resists road salt and errant snowplow blades. When there’s roadwork to be done, granite curbs can be lifted up, set aside, then put back in place. Apart from the bookkeeping issues are those of community pride and urban beauty. Answer Man thinks that wherever possible we should strive for beauty, even in the lowly and the mundane. After all, Washington is a city of straight lines, from the grid that Pierre L’Enfant drew when he laid out the city to the knife’s edge walls of the National Gallery of Art East Building. Granite curbs help to crisply delineate the landscape, separating street from sidewalk and reminding us that it’s nice to live in a beautiful city. A video supplementing Kelly’s column is available. Also, the American Granite Curb Producers website provides detailed information about performance and costs. Planners and urban designers often talk about the “human scale” in walkable areas. But what does that really mean — is it simply a case of “I know it when I see it”? Are there more specific ways for people to describe why some building frontages seem especially friendly and welcoming? For the design of storefronts, a very useful booklet is Thrive: A Guide to Storefront Design in the District of Columbia (2002), by Derrick Lanardo Woody. The booklet covers the elements of human-scale storefronts in an easy-to-understand format and with plenty of photos. At first glance the notion of free-market parking meters seems impossibly arcane. But as Donald Shoup pointed out in a recent NY Times editorial, “cruising for curb parking generates about 30 percent of the traffic in central business districts.” Shoup studied Westwood Village, next to the UCLA campus, and found that drivers searching for curb parking created 950,000 excess vehicle miles of travel per year. That’s equivalent to 38 trips around the earth, taking place in just one retail district in L.A.
Shoup calls the impacts of parking space cruising “astonishing,” and he’s right. The unnecessary traffic congestion hurts downtown businesses and activities. The extra miles traveled waste gasoline and generate pollution. If curb parking could somehow be freed up so that it was always easy to find a space, then that extra waste and pollution could be eliminated. One solution is free-market parking. Set parking meter prices so that 85% of spaces are occupied and 15% are open at any given moment. This idea has been getting more attention lately, and Redwood City, CA is the locality that has put the most advanced implementation into action. This was published a few years ago, but I just came across it recently. It is Close Encounters With Buildings, an article by Jan Gehl, Lotte Johansen Kaefer and Solvejg Reigstad. Gehl is one of the world’s leading urban designers and author of several books including the pathbreaking Life Between Buildings. “Close Encounters With Buildings” provides an explanation and definition of pedestrian-scale facade design. 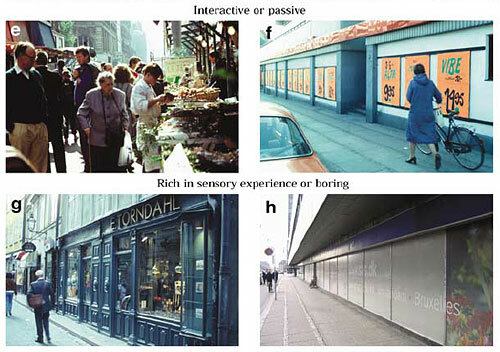 It reviews several systems for understanding and classifying the characteristics of facades which can either enhance or diminish the attraction and liveliness of pedestrian space. There are as many different opinions about architectural beauty as there are individuals. Compare any two buildings created with completely different philosophies of style. If you selected a group at random and asked which building’s appearance they preferred, you’d get a lively discussion ranging from indifference, to liking both, to passionately preferring one or the other, to hating both. Many of the building elements that people relate to beauty are also the most transitory. Elements like facade color, cladding, window treatments, etc. are the easiest things to change. So when Wal-Mart, for instance, wants to show that it’s addressing community concerns about aesthetics and context, they’ll clad their big boxes in styles that reference local heritage in some vague way. Hill Country stone in Austin, rustic trusses in Colorado, Georgian brick in the Mid-Atlantic, etc. But the end result is still a tilt-up, single-story big box in a sea of parking. In the opinion of many urban designers, the most important architectural factor that supports a pedestrian-friendly street is not the style, but rather the form of the building. That is, the way the building is sited on its lot, the way it meets the sidewalk, its frequency of doorways and windows, and its general shape and mass.